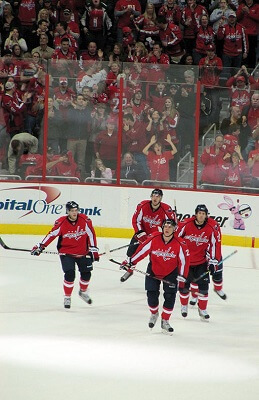 Get notified when Washington Capitals tickets are available! Founded in 1974, the Washington Capitals are a professional hockey team that plays in the National Hockey League. The team won their first Stanley Cup as league champions at the conclusion of the 1997 to 1998 season. Home games of the Washington Capitals have taken place at Verizon Center since 1997. Situated in Chinatown, a neighborhood in Washington D.C., the arena can hold a little less than 20,000 people on game night. If you’d like the chance to watch the team play live, you can check the schedule above and use the links to purchase Washington Capitals tickets online.